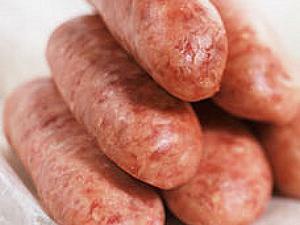 British and Irish sausages are normally made from pork or beef mixed with a variety of herbs and spices. They normally contain a certain amount of bread rusk, and are traditionally cooked by frying, grilling or roasting prior to eating. Due to their habit of often exploding due to shrinkage of the tight skin during cooking, they are commonly referred to as bangers, particularly when served with the most common accompaniment of mashed potatoes to form a bi-national dish known as bangers and mash. (The designation banger was in use at least as far back as 1919 and is often said to have been popularized in World War II, when scarcity of meat led many sausage makers to add water to the mixture, making it more likely to explode on heating).